Here we go with Five Random things! 2) I use bloglovin’ to read blogs I really like it. Mostly because I can read any blog from any host. I could only read word press blogs in the word press reader. I do have one question, though. If I’m following people on bloglovin’ should I also follow them on word press? It would only take a second to click the follow button, but I usually don’t bother. Should I? Even if I don’t use the word press reader someone might like to know they’re being followed. Any one have thoughts on this? 3) I took the Cherry Juice Challenge! Originally, I thought this would get it’s own post, but I didn’t really think I had enough interesting things to say. So here’s the bare bones: I read about the challenge on the No Meat Athlete blog, got some concentrate from the internet, and I drank 2 tablespoons of tart cherry juice concentrate (diluted in water) every day for 16 days. 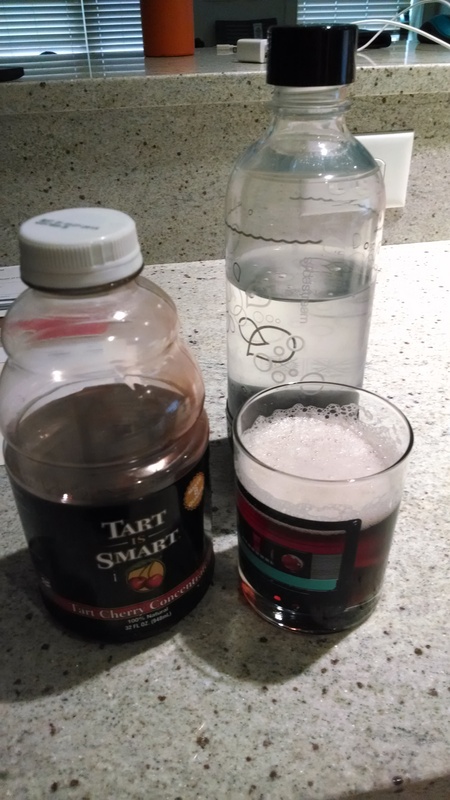 Tart cherry juice is supposed to help reduce muscle soreness and improve sleep quality. I can’t say I noticed a difference in muscle soreness; I’m not usually very sore in the first place, so there wasn’t much to compare. I think I’ve been sleeping more soundly, and my fitbit seems to agree (it says I’ve been restless less now than I was before), but I’ve never been a bad sleeper so again there’s not a lot of room for improvement. Final thoughts: Cherry Juice is delicious and I’m going to keep drinking it because I look forward to it every day. I like to think it’s beneficial, but when it comes down to it, my proof is somewhat flimsy. You’ll have to try it out for yourself. I like to add the cherry concentrate to seltzer water. 4) Next week I’m changing up my eating For a whole bunch of boring reasons I’ve been wanting to change up what I’m eating, and because of that I’m doing a 28 day challenge/diet starting on Monday. I’m excited to try out some new foods and recipes and see how eating healthier makes me feel. But I’m also nervous. I’ll be cooking a lot more than normal (and I’m sort of delinquent in the kitchen), and I’ll be avoiding or switching up some recipes that are current staples for me. I’m a planner, so I’ve got a whole menu set out for next week already, I just need to do some serious food shopping and prep this weekend. Wish me luck! Since this isn’t a food blog, I probably won’t share too much about this, but if I find a particularly delicious recipe I’ll post it, and if the diet makes me run faster, longer, awesomer, I’ll be sure to let you know! 5) Walking 10,000 steps per day is tough! I’ve been building up my number of steps per day all summer, and ever since I passed 8,000 it’s been a lot trickier to get in enough steps, especially on days I don’t run. I’m not sure how many steps per day is my final goal, but I better start walking more if I have any hope of getting it. Are you a good speller? Have you ever changed your diet drastically? How many steps do you walk per day? It’s Friday! And a special one – 4th of July! I hope everyone else is having as nice I time as I am today. And, I’ve got some awesome plans for tomorrow, too. I get to see my sister, brother in law, and baby niece! Yipee! 1. Not every Friday is a Friday 5 Friday. I keep a draft of this post and add things to it as I think of them. When I get to 5 things, I post the next Friday. Sometimes this happens every week, sometimes it takes a little while. Maybe this is strange, but I don’t want to force it. I prefer free flowing randomness. 2. 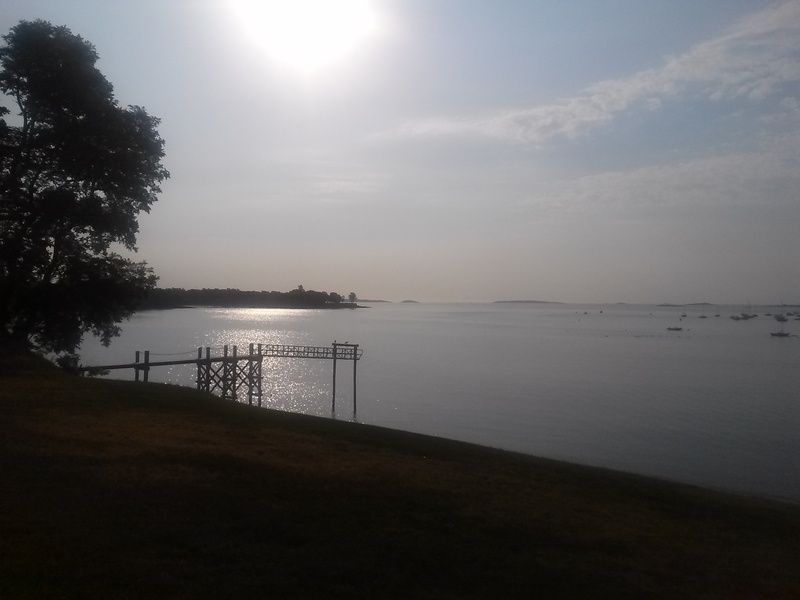 I managed to pull myself out the door twice this week for “early” morning runs. Even at 7am it is hot, and so HUMID! But it gets nearly 20 degrees warmer throughout the day, so I’m pretty glad I got some runs in early. I really think you can actually see the humidity in this picture. Or it’s just blurry. 3. I’ll be 30 this month! I don’t have any problem with the idea of being 30, but it’s crazy to think about. I’m a real live grown up! 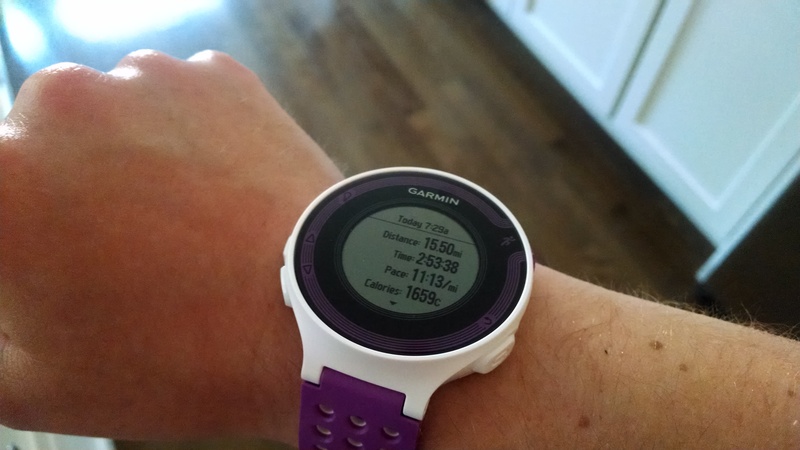 Tying this back to running, I’ll be entering a new age group…a whole new opportunity for PRs. Since I started running in my 20s I’ve always been in the same age group, but now I’ll have a new one, and can start tracking age group PRs! Exciting! 4. I got a new computer. I broke my computer about a month ago by spilling tea on the keyboard. (Ugh, I still cringe just thinking that I did that.) Today I got a new computer, and this is my first post on the new guy. 5. Happy 4th of July! 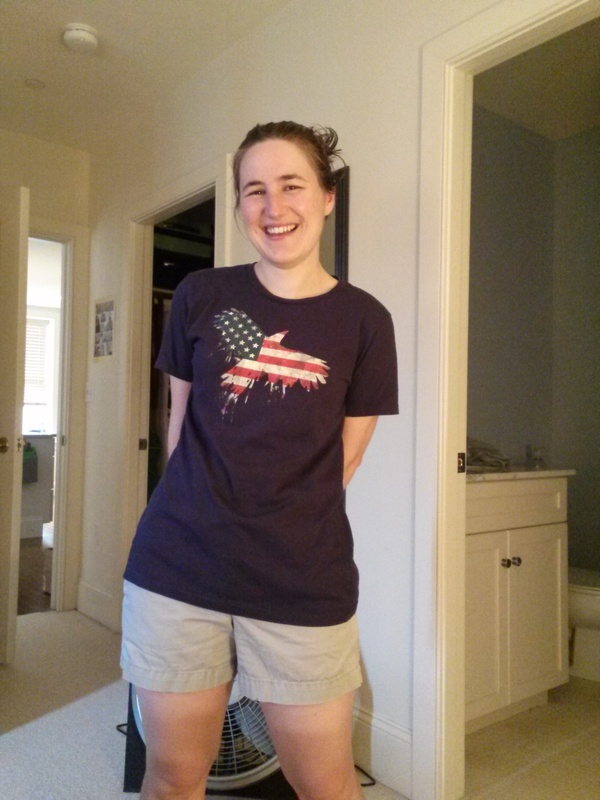 I’m rocking an awesome new t-shirt today, and I ran in my USA tank this morning! It may have rained all day, but running in the pouring rain was awesome, and I’m having a fun, albeit wet, holiday! It’s Friday! Last night I ran an easy 2.5 miles. This run felt much easier than Tuesday’s easy run, although my legs felt somewhat creaky after Wednesday’s interval workout. I was considering doing a tempo run today instead of taking a rest day, but now I’m thinking my legs might want a rest even if my brain doesn’t. 1. I bought teeny tiny little shoes for my niece, baby C. Aren’t they just the cutest? My other niece, baby S, will most likely also be getting some teeny tiny shoes in the near future. (I want to buy a million pairs!) Although, I’ve heard she likes to have bare feet. 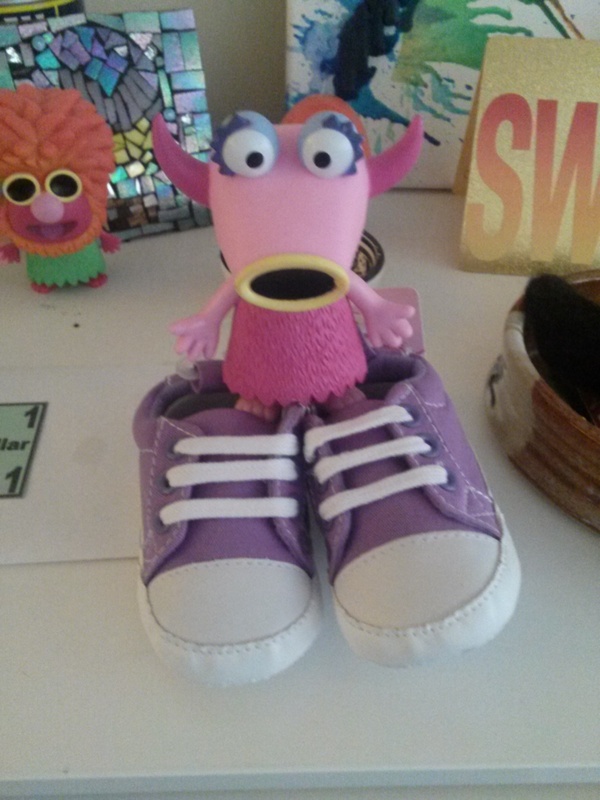 Those are not your shoes, Snowth! 3. Lists. I love making lists. I’ve been trying to come up with what kind of challenge to do when I finish the 100 happy days challenge, and I think I may make something up that has to do with making lists. Another idea I’ve had is that I want to start a grateful/thankful things journal. I’m not sure if I’d do one or both of these things. I’m also not sure whether these would go on the blog. They’re not really running related, but I do think the blog is a good place for making lists. 4. Boats are out! A little change in scenery on my runs. Another sign that summer is right around the corner. 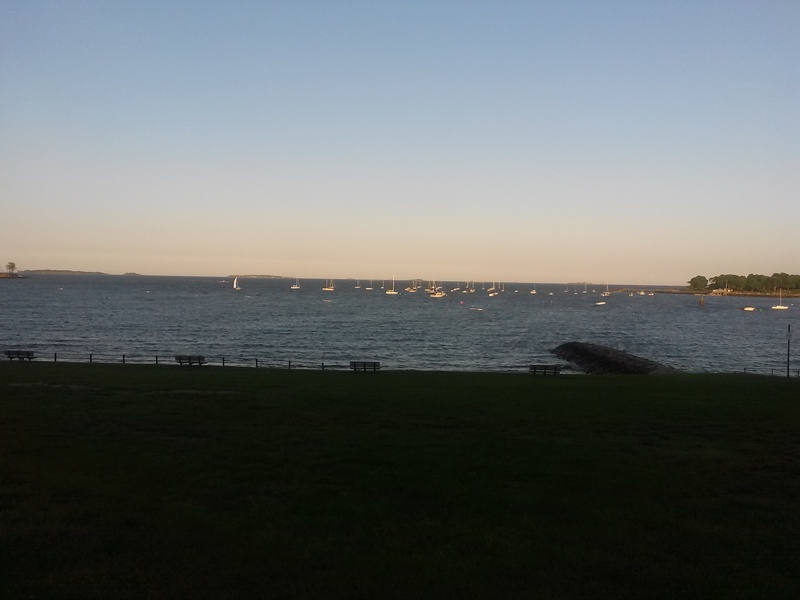 Those tiny white dots are boats. They looked MUCH bigger in person. 5. Game Night! Tomorrow is game night with some friends! I love playing games and we’ve been trying to get this group together for AGES! I’m excited that it’s finally happening. Woohoo! One of my non-running related New Year’s resolutions was to play more games. My plan was to try to have one game night per month with friends/family. We haven’t done that exactly (I think we’ve missed 2 months), but we have definitely been playing more games. We started a “Journey of Games” (I think I’ve mentioned this before), and we’re playing all the games we own, rating, and decluttering them. There is a spreadsheet involved, so this has been doubly awesome. Aside from the weather, what other differences do you notice about summer running? What’s your favorite game? 1. It’s not very warm out yet, and I love it! Okay, I whined about it being cold and rainy on Wednesday, but once I got outside, I remembered that 48F is actually a pretty perfect running temperature. It didn’t take long for me to have some sense knocked in to me. I am now appreciating every sub 60F day, because I know I’ll long for them in a few months. This is good. I don’t care if it’s almost June. 2. I’ve been doing short runs lately. My legs are feeling much better now than at the beginning of the month, but I’m still keeping most of my runs fairly short (between 2 and 4 miles). Yesterday, I ran with Jeff for 25 minutes. It’s nice to get a run in and still have lots of free time. 3. Yesterday’s post got a lot (for me) of responses. 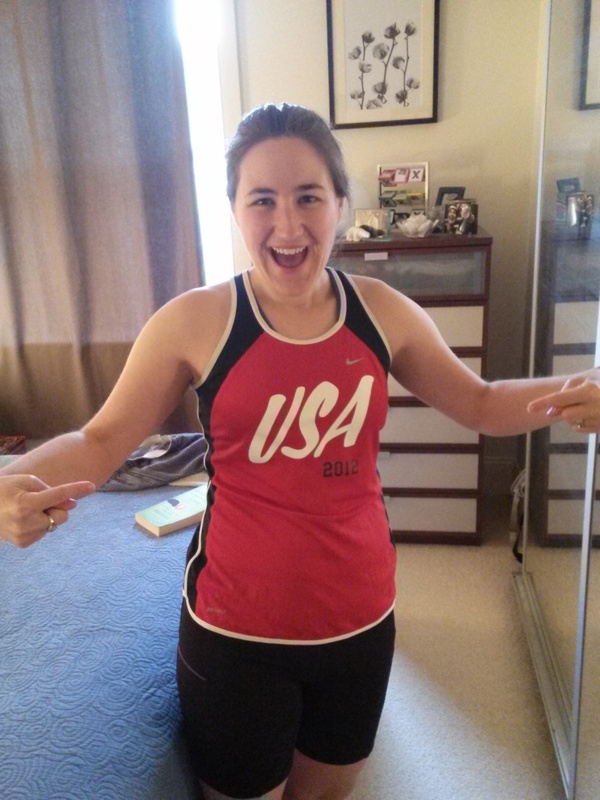 I liked reading all the how I started running stories people commented with! I’m glad I posted about how I started running; I always thought it was kind of boring (still do, actually), but it resulted in some fun comments, so it was a good choice! 4. I love to Juggle. After mentioning joggling last week, I’ve been juggling more often. In fact, I decided last Friday to start a little knitting project. 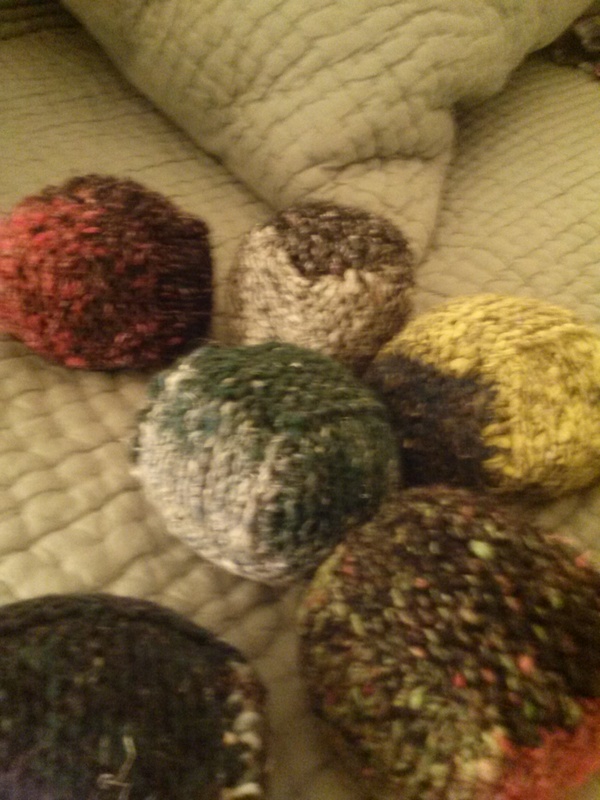 Over the course of a week, I have now knit 6 juggling balls. I love them! I still have no plans/desire to joggle, but I’ve started juggling on a regular basis. Aren’t they awesome? And they’re filled with beans! 5. 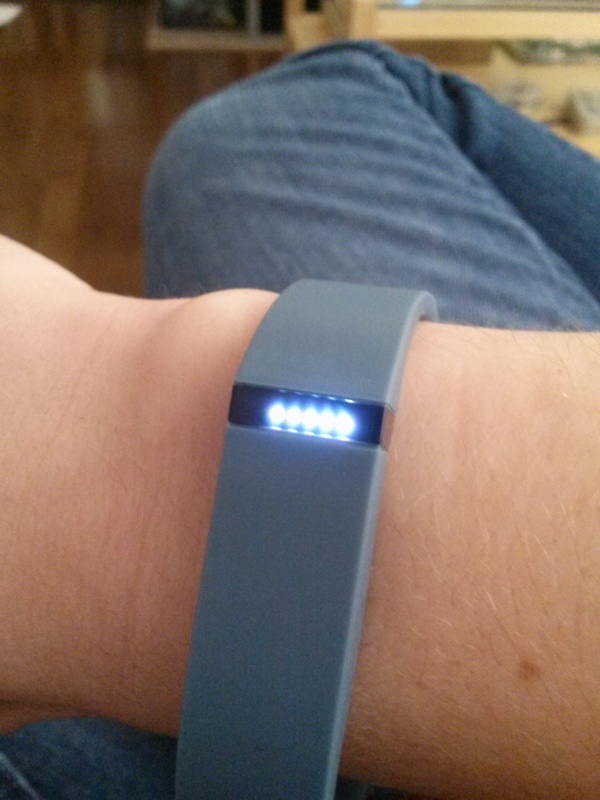 I got my fitbit! It finally arrived, and works! Woohoo! Now I’m back to tracking my steps. I’m working my way up to 10,000 steps per day. I started with a goal of 1,000 steps in a day (easy), then I moved on to 2,000 steps for two days in a row; then 3,000 steps for 3 days in a row, etc. These early ones aren’t hard, but I like to have a system. When I get up to 10,000 steps per day for a week straight, I’m giving myself a reward. Any interesting plans? How do you feel about cool temps when it should be warm? Do you juggle? Do you reward yourself for exercising? 1. 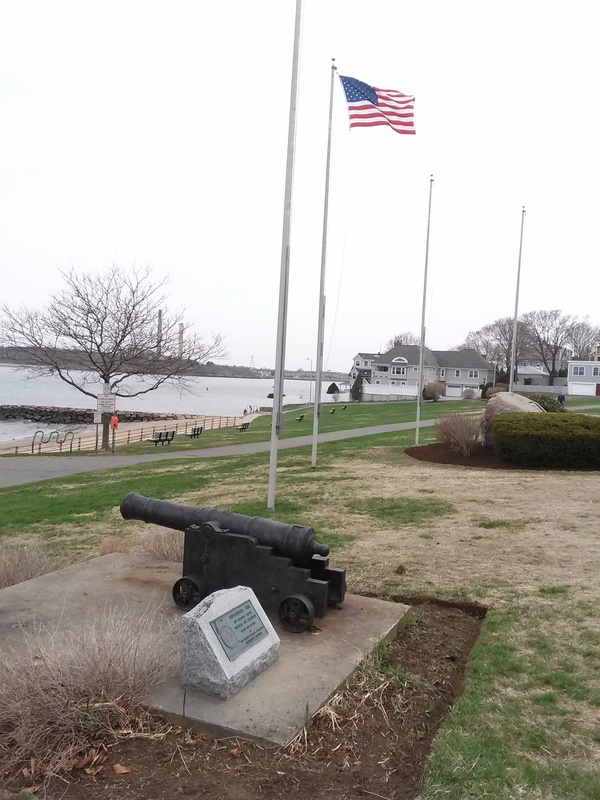 This weekend is Memorial Day weekend I have a plan to count all the flags I see on my run on Monday. Then (if I remember) I’ll do the same on July 4th and report back as to which is the flaggiest holiday. I’ve been thinking about doing this for some time now. 2. I’m going to try trail running this weekend. Or if it’s too hard, maybe it’ll be mostly a walk. I’m nervous about tripping, and also about bugs, ticks, poison ivy, etc. Why am I do this again? Nature, ick! 3. My fitbit is coming tomorrow! Remember on Tuesday when I complained that fitbit was out of stock in my color and I had to wait. I guess they were wrong because the very next day it shipped! According to tracking on the USPS site, it should get here on Saturday. Hooray! 4. I’d like to knit a blanket for our bed. I have to find a pattern I REALLY like though, because it turns out I will need an extremely large amount of yarn to do this. And, yarn is NOT cheap. 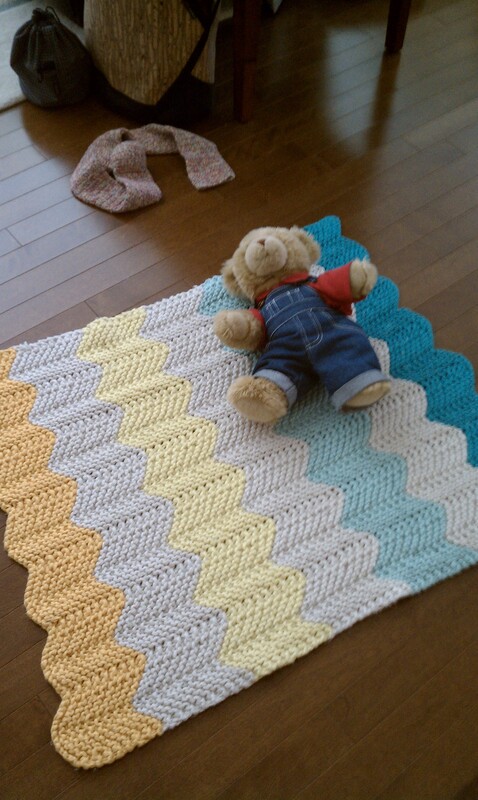 It took months to knit this baby blanket – about 1/9 the size I’d need for my bed. It may take a decade to knit something for my bed. 5. Have you ever seen a Joggler? I learned to juggle a long time before I was a runner, and was intrigued by joggling (running while juggling) as soon as I heard what it was. It’s never something I’ve wanted to do myself (cue visions of dropping a ball and breaking an ankle as I trip on it), but just thinking about it makes me smile. I saw a joggler once in a 5k and I was ecstatic… a real life joggler! The record for women’s 5k joggling (3 balls) is held by Trish Evans – 21:46. This is 4 minutes faster than my current 5k PR sans juggling. I hope you enjoy your long weekend, and if you decide to run on Monday, let me know how many flags you see!